Internet connection and a web broswer are the only requirements. Recommended browsers are Chrome and Mozilla Firefox. You can't save document subcorpus sets. Searches are either performed in the whole HNC corpus or in the selected set during the current session. Search results are always limited to 5 sentences max. In "Statistics" page, only the top 100 most frequent words/lemmas are available. Perform searches in the whole HNC corpus but also in any subcorpus set you have selected. Perform searches based on a word, lemma or a specific part of speech. 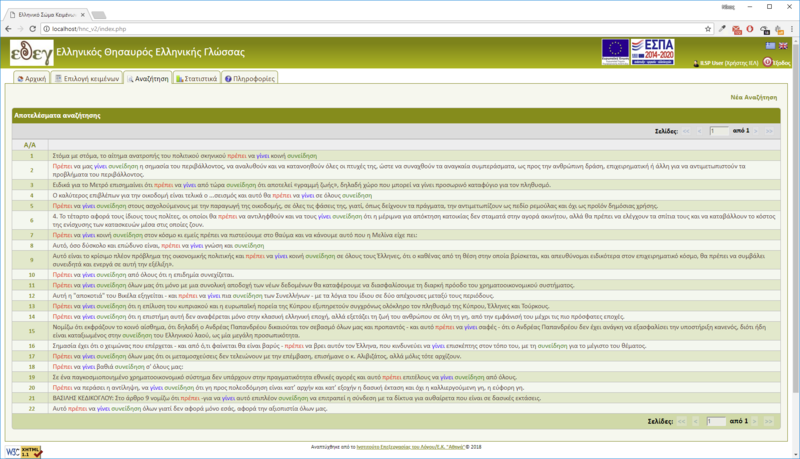 Receive up to 2000 sentences as a search result. Load previously saved subcorpus sets and perform searches on them. For further information about subscriptions (procedure, costs etc. 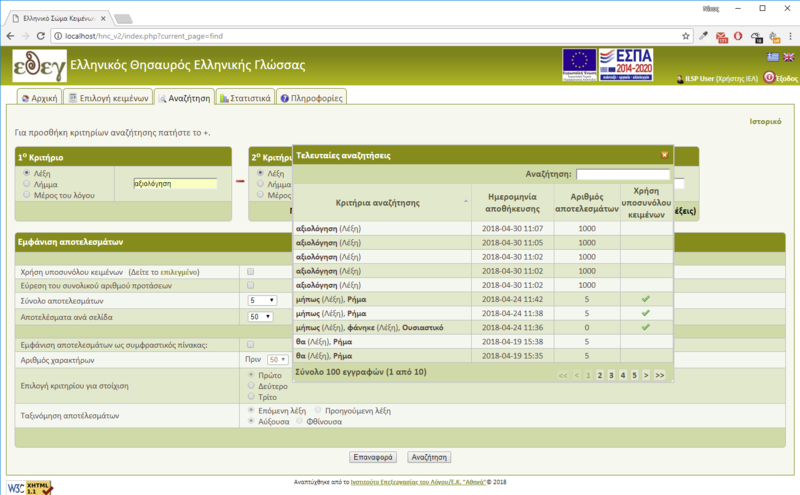 ), you can contact hnc@ilsp.gr. As a Guest, you have no right to save a subcorpus set and perform searches with previously created ones. Searches are performed in the whole HNC corpus or in the subcorpus set created during the current session. Figure 1: Selecting filters to create a document subcorpus set. Figure 2: Selecting values for the selecting filter. If you create a subcorpus set, it is automatically saved so it can be later used. - Button Ctrl + value (for selecting non successive values). The same procedure is repeated for any number of filters. Filter selection process can be canceled at any moment by pressing the 'Cancel' button at the value selection window or by just closing the window. 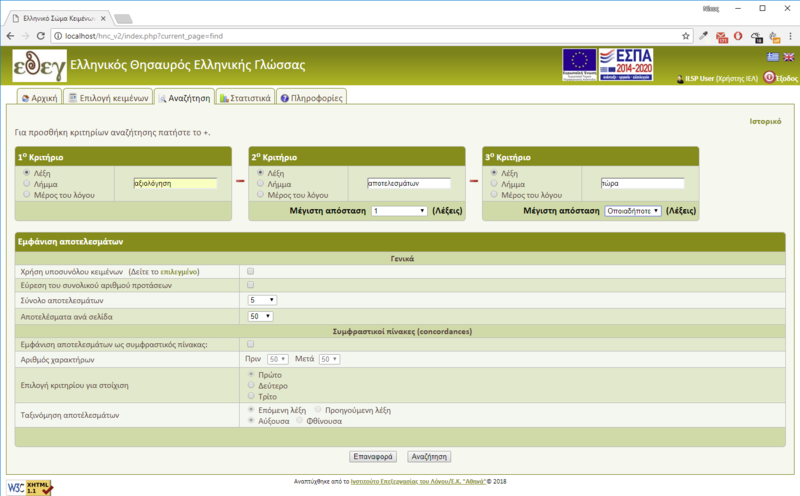 After completing the document selection, you can proceed to sentence search. You don't have to store the subcorpus set during your current connection because it is automatically saved. In case you want to keep it for future use you can save it manually and then load it from your profile page. System's functionality is as follows: you can pose the system with certain types of searches and the system responds by sending sentences that satisfy the criteria selected by the user (Figure 3). Search queries contain from 1 to 3 criteria and you can add or remove search criteria by pressing the + or - icon button (Figure 4). 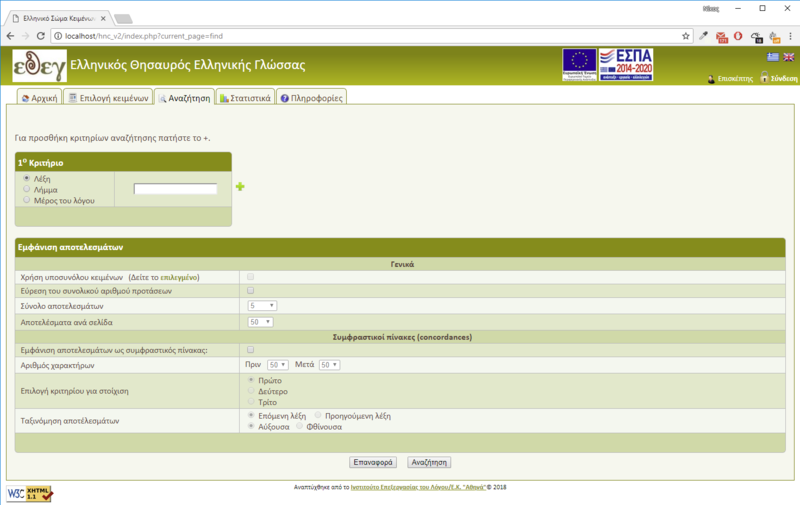 Figure 3: Search form page of the HNC. Setting up from 1 to 3 search criteria and varius settings combinations. Search can be performed for: words, lemmas and parts of speech (or combinations of those three criteria types). You have to use stresses where is needed, but words or lemmas are case insensitive. Figure 4: Selecting 3 criteria to conduct a complex search query. You can set the maximum number of sentences that will be returned as result, and also the maximum number of sentences per result page. Wildcard characters can also be used in case of word or lemma criteria. To replace only one character, the user must use '_' character, (underscore) while for more than one characters '%' (percentage) can be used. - %δημα% (all words including the string "δημα"). For each criterion, when it is a word or a lemma, you can use the logical operators OR (|) and NOT (|^). Figure 5: Displaying the search history of the last 100 searches conducted by the user. Search results for a guest cannot be more than 5 sentences. Search results for a subscriber can reach the total of 2000 sentences (Figure 5). A search result is a list of sentences without a strictly set order. Results are numbered. Each number is a link providing all document info in which the sentence was found (Fig. 3). To return to the search list you can close the popup window. Figure 7: Displaying search result in concordance table form. Figure 8: Displaying HNC and user statistics info.